Less than five months after yellow-shirted anti-government protesters seized and closed Bangkok‚Äôs two airports stranding hundreds of thousands of international tourists, the country is headed towards further political unrest after more than 150,000 pro-democracy red shirt protesters rallied in Bangkok today. The protesters first massed in front of Thailand‚Äôs Government House before an estimated 60,000 of them headed to the nearby residence of revered former prime minister and current Privy Council President General Prem Tinsulanonda and broke through a large police cordon to lay siege to the compound. The protesters also called for Thailand to be governed under the constitutional monarchy and by international standards, with a person who abides by democratic principles and is accepted by society allowed to take responsibility. 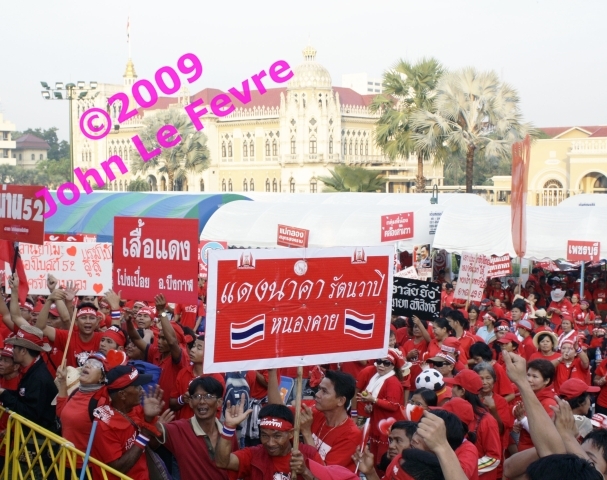 General Prem and the privy councilors have been targeted by the red shirts after fugitive former prime minister Thaksin Shinawatra named them as being masterminds of events leading to the 2006 military coup d‚Äô√©tat that forced his elected government from office. Thaksin was elected for a second term as prime minister in February 2005 in a landslide victory which saw the largest voter turn-out in Thailand‚Äôs history, but deposed by a military coup d‚Äô√©tat in September 2006 while he was in the US. The UDD has close links to Thaksin, who fled Thailand last year while on bail prior to being convicted in absentia of a corruption charge stemming from land purchased by his now former wife. Over the last few months Thaksin, who was born in the Northern Thailand province of Chiang Mai and who has a large following in Thailand‚Äôs rural north, has constantly infuriated and frustrated the Bangkok establishment and elite by moving from one country to another, while making dozens of video and telephone calls to rallies of his supporters. Attempts by the Government to disrupt his telephone calls and block his video calls have largely failed, with the former telecommunications industry tycoon and billionaire constantly making the current government appear inept in their attempts. For the last few weeks Prime Minister Abhisit and his Democrat Party government have largely dismissed the rallies by the pro-democracy UDD as being little more than an irritation, while at the same time desperately trying to coerce countries which Thaksin has used as a base for his video calls to extradite him ‚Äì despite Thailand not having formal extradition agreements with most of them. Today the irritation became major, festering puss-filled boil for the government when hundreds of buses, private cars and trains began disgorging red-shirted supporters of the UDD from Thailand‚Äôs northern, southern, eastern and western-most provinces. Between 4.00 and 4.30am alone more than 150 buses and coaches arrived at the Government House assembly area, sending a clear message to Prime Minister Abhisit that Thailand is now divided and those who live outside of Bangkok are not pleased with his governments policies, which tend to favour the Bangkok establishment and elite. Prior to the rally members of the government had predicted as few as 30,000 people would attend but by 6.00am this figure was well and truly exceeded as convoys of buses converged on the area surrounding Government House ‚Äì many having taken more than 12-hours to get there. The Government, some segments of the media, and the so-called People‚Äôs Alliance for Democracy (PAD) movement, which last year seized control of both Bangkok airports and engaged in violent clashes with police and anti-PAD protesters, try to paint the red shirts as uneducated, working-class poor from Thailand‚Äôs rural provinces. Today‚Äôs turn-out shattered this misnomer with protesters comprising the young, the old, the firm, the frail, Buddhist monks, current and retired university lecturers, school teachers, civil servants, and small and medium sized business owners, as well as the rural, working-class poor who benefited most from the policies of former prime minister Thaksin. Rejecting the call by protesters for him to resign and call fresh elections, Prime Minister Abhisit said his government also wanted to advance democracy but this had to happen in a peaceful manner via political reform. 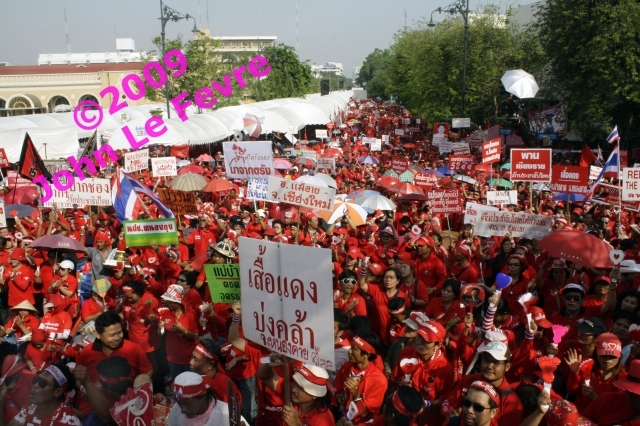 He said that while the red shirts had a right to rally and protest his government will not allow the protesters to riot or stage a people’s revolution. 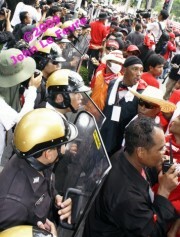 ‚ÄúThe government will try its best to deal with the protesters using non-violent measures,‚Äù he said. This most recent round of protests is expected to do little for Thailand’s tourism industry, which has suffered severely on the back of last years protests by the PAD which stranded hundreds of thousands of tourists when Bangkok and regional airports were closed amidst violent street protests and images of yellow-shirted protesters shooting at opponents from the back of pick-up trucks. 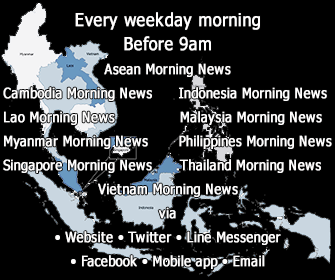 More background to the ongoing Thailand political situation can be found at Thailand on the edge ahead of mass pro-democracy¬†protest and Red the new yellow as protesters back on Bangkok¬†streets. A photo special on today’s mass rally by the UDD can be found at Thailand pro-democracy rally, April 8, 2009 photo special. 5 Responses to "Thailand political unrest continues as hundreds of thousands rally in Bangkok"
MAI 30ht THE RED SHIRT IN MUKDAHAN CITY ! FROM 6 PM —-24 PM !!! It certainly appears as the Thai population are not as happy as the Royal Thai propaganda dept would have us believe. One has to seriously question the holding of such meetings within such a country. Excellent background and informative report on the Wednesday events, with some fine photos. I will be following your blog from now on. Thanks very much. I’m glad you found it informative.